Oh, how they’ve grown in six months! Miss Marvelous and family moved from Ka‘a‘awa to Naples, Italy, where her dad works. 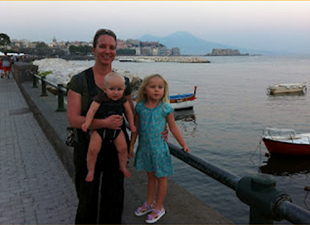 Here is a photo he made over the weekend of her mom, her baby sister, and her at the bay of Napoli. That’s Mount Vesuvius in the background. Papa and Popo (DH and me) will visit and tour with them in October on the days when the child is not in school. Our granddaughter, 3, attends Italian school. She is one of two Americans in her class of 16 children. This year they are learning Italian and English; the English teacher is from England. Her parents have enrolled her in a special afternoon music program, too. When I visit, I’m planning to play with the kids, do some sketching and painting, eat pizza, learn some necessary Italian phrases, explore my surroundings, and drink Chianti while watching the sun set as it rises in Hawai‘i half way around the world — not necessarily in that order. Mahalo, Gayle, for stopping by. I’m pretty sure I’ll sending posts from Italy in just a few weeks!